In August, I posted about finishing my (commercially) space dyed yarn afghan. (That post here.) Instead of fringing it, I decided that I wanted to crochet an edging all around. Finally, with cooler weather, I've gotten that done. I decided on a simple closed shell edge, to compliment the zig zag effect of the twill treadling. 1st row - American single crochet (double crochet in the UK) all around in solid blue (the same as the weft yarn). 2nd row - a shell row consisting of *5 American double crochets (UK trebles) in one stitch, skip 2 stitches, one US single, skip 2 more*, repeat from *. For the shells, I used the space dyed warp yarn. I didn't figure out the corners till the last one, but oh well, who's gonna notice from a galloping horse? I think that as a Christmas gift, this will be appreciated by the recipient. However, as an experiment in space dyed yarns, I'm not satisfied with the results. I tried to measure the color changes in bouts, but the commercial dye job was too inconsistent, so that the color changes aren't even and the effect is too stripy. So I reckon that leaves me with dyeing my own warps, which is an adventure I'll save for another time. Well Leigh, I like the colors and I think the blanket is lovely. I used to love to crochet edging and had forgotten all about that. Once upon a time, all my pillowslips had personalized edgings. I had only heard your expression from my grandmother, only she said, "Who's going to notice that on a galloping horse." It's a great philosophy and allows much forgiveness. I'm *still* working on assigning tags - what a chore!! Very nice! The shells really compliment the zigzags. 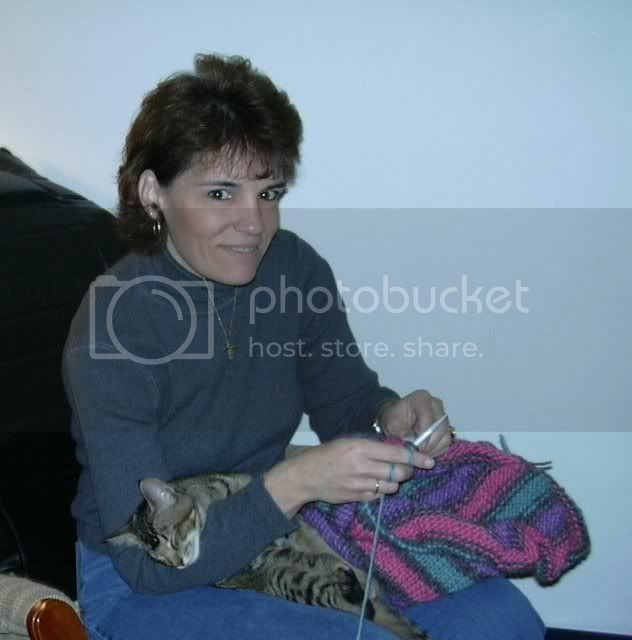 Ho did you finish the warp ends to prepare them for the crocheting? I love the crochet edge idea. Will have to remember that in the future. Very nicely done. Beautiful!! How did you finish the "fringe" sides of the blanket so they could be crocheted? In regards to finishing the cut edges in preparation for crocheting, originallly I planned to use my sewing machine to sew down the warp ends. However, my sewing machine is having tension issues so I ended up doing it all by hand. I found that I had to sew down 3 weft threads when I secured the warp, otherwise the weft wanted to unravel. It was a bit of a job, but the whole thing held together through machine washing and drying. After hand sewing, I did one row of single crochet all around and then the shells on top of that. Sharon, you might be interested to know that I learned that phrase from my grandmother too. I like the effect of the crochet edging! Lovely! The crochet shows off the variegation of the yarn and so gives a context for the woven area. The result is a whole entity where each part, edging, and weaving, support each other. I'm so glad you decided to do that. Wouldn't have occured to me to do the crocheted edging...it's inspired! And quite lovely. Well done! I love it Leigh and I'm certain whoever is lucky enough to receive it will too. Fringe often looks nice on a blanket, but when I'm using a blanket, I'd much rather not have fringe. I think your crocheted edging is just perfect! I love Shetland. I think it is THE wool for handspinners. The first time I tried it, I had the fleece in a mesh bag. It did not work obviously. really is not that big of a deal. Some lucky person will be getting a beautiful Christmas present! I'm wondering what the fibre is though,I went back to your earlier post but don't think you have mentioned it, is it a wool yarn? Is it one that is sold as a weaving yarn? I'm getting more curious about the possibilities of different yarns and, frustratingly, I find most of the weaving books I have assume you will work yarns for yourself. Sorry Dorothy! 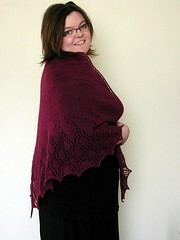 I forgot to mention that this is made from acrylic worsted weight knitting yarn. I've only made one wool afghan, for someone who won't mind hand washing!